Tony Blair went at the moment of his choosing. But eventually, the moment was largely determined by a narrow window of opportunity. This was the week where his contributions to peace in Northern Ireland eclipsed his contributions to the conflict in Iraq. It also was the week of his tenth anniversary as Prime Minister. The Times makes its sentiments clear. Its article reads like a long-prepared, mischievous (but fascinating) obituary. Remember when ASBOs were first proposed by a fresh-faced Tony Blair in 1995? Or when Sharon Storer publicly ambushed Blair in 2001? And who could forget the G8 Summit in St Petersberg in 2007, when a live microphone picked up President Bush greeting the Prime Minister with the words: “Yo Blair”? This gave the clue to the planning behind this week’s announcement: Ten years at number ten, May 2nd 1997- 2007. Taking both views together, we quickly recapture some of the highlights and lowlights of his leadership. By 2005, Tony Blair was being compared with Margaret Thatcher for his Presidential style of leadership. There were also prescient suggestions that he might also have further parallels in the nature of his departure. Political Journalist John Sergeant was one such commentator. His insightful remarks, almost as an aside, can be found in his biographic description of his own encounters with Margaret Thatcher. But if Maggie could claim political gain from her military adventure in The Falklands, Blair’s legacy increasingly is seen as the architect of the Iraq war, and (most cruelly) as Bush’s poodle. ‘Blair has been widely criticized from within his own party for championing the policy on Iraq of U.S. President George W. Bush. There is a general perception in the UK that Blair repeatedly misled the UK parliament and public in echoing the U.S. claims that Saddam Hussein had weapons of mass destruction and that invading and occupying Iraq was legal. As a result, some Members of Parliament have formed a group to call for impeachment hearings. Further pressure was put on Blair in September 2004, during the UK Labour Party conference, when the London Evening Standard newspaper published details of a leaked Pentagon briefing paper, Operation Iraqi Freedom: Strategic Lessons Learned. The document reveals that in October 2002, the Pentagon finalized its Full Operational Battle Plan 1003V for the Iraq war, at a time when Blair was insisting that no decisions had been made about whether to go to war. Independent political editor Andrew Grice pinpointed the moment Tony Blair lost his authority as November 9th 2005, 4:56 pm. Mr Blair’s first Commons defeat since coming to power in 1997 was heavier than expected and provoked speculation at Westminster about how long he could remain Prime Minister. [His] personal authority was badly dented … when he suffered a humiliating defeat over his plan to allow the police to detain suspected terrorists for up to 90 days without charge. [The defeat] was heavier than expected and provoked speculation at Westminster about how long he could remain Prime Minister. I have sometimes mused on Chess as a powerful metaphor for strategic decision-making. Specifically, The Tarrasch Principle, advices chess players to take action ‘because you want, or because you must, and not just because you can’. Tony Blair, like so many leaders, wanted to preserve his options on that biggest decision of all, the moment of his going. As hard as he tried to secure wriggle room, he found himself being pinned down. Eventually the next best thing to clinging on, was to go ‘before things got worse’. It was a symbolically convincing moment. He went not because he wanted to, nor because he was able, but because he had to, lest there would be no better time in the future. This post takes the humanistic legacy of Carl Rogers to explore: Leadership as map making; Leadership as block busting; and Leadership as bridge building. It offers a framework for use in leadership development progammes at undergraduate, graduate, professional and executive levels. The title of this post acknowledges the work of Carl Rogers, a pioneer (with Abe Maslow) of humanistic psychology. His ideas on personal development have since come into common currency. In particular the post connects leadership to the title of his most influential book, On becoming a person. Carl Rogers (1902-1987) conceived of human development as the process of becoming (self-actualizing). Although his major professional world was that of clinical therapy, his ideas have become influential beyond that domain. His dominant idea is that the process of self-actualization is natural, albeit hindered by various life experiences. We each have an instinctive desire (an aspiration) to develop our potential. Furthermore, we feel good about ourselves when we are engaged in the processes of developing our potential. This is at the heart of another key concept, that of positive self-regard. (terms such as self-image and identity can be traced back to his work). At a personal level, positive self-regard is unconditional in nature. However, social groups have developed in ways in which self-regard receives only conditional respect. That is to say, we become restricted by the conditions and rewards of the social group. Such reinforcement distorts the natural processes of development. The individual may have trouble dealing with the gap between the expectations of the group, and his or her perceptions of ‘the real me’. Over time the individual deals with the problem through psychological defences (Rogers notes two major defence systems, distortion and denial). The core of Rogerian theory is the capacity of the human to self-development. You are your most important teacher and moral leader. However, he also was concerned with the process of developing others (particularly those with seriously damaged processes of self-actualisation). The Rogerian therapist strives to develop openness (‘congruence’), empathy, and respect (unconditional positive regard). If we are to borrow from Rogerian theory for leadership development we must examine whether these principles can translate. As a first step, we can see how Rogers had worked out a model for encouraging individuals to achieve their potential. This is what the therapist does. I believe we can indeed borrow many of his ideas (changing what needs to be changed) to arrive at a more general model for leadership and for leadership development. We will be connecting the ideas of Carl Rogers with the leadership text, Dilemmas of Leadership, to explore the importance of map making, block busting and bridge building in leadership development. Dilemmas of Leadership suggests that leaders develop themselves through processes of map reading, map testing and map making. The mapping processes are metaphors of journeys of self discovery. During the journeys, maps of received knowledge, and examined in the context of direct experience leading to revision of personal beliefs. Dilemmas of Leadership suggests that a text can be read as a Platform of Understanding or summary of a belief system. The POU is a kind of map, ready for use. It covers the historical maps of leadership from trait theory maps, through situational maps, to those maps dealing with new leadership concepts (transformational leadership). To take a simple example, a student may read a book about leadership and extract from it a map of what leadership is all about. She then has a personal assignment – let’s say it is in a volunteering project. During the project she experiences various events which can be connected to the things she has read in the textbook. The process of testing enables her to make sense of the text-book connected through her own experience. This, in turn, strengthens her skills in future leadership roles. When she acts, she draws on the (always developing) personal map she has been making. This blog can be seen as a series of maps about leadership drawn from the news stories appearing every day of the year. Out of personal choice I select a story that seems to have some leadership interest and summarise it for myself. Towards the end of that stage of map-making I find myself doing some map testing. Does the story fit with what I already believe I know? Even more rarely I might make a new connection and discover a new (to me) leadership concept. For example, I came across several stories about threats, either by a leader or to a leader. A recent rather complicated one involves the chairman of The Royal Mail, Allan Leighton. You can follow the story in an earlier blog. The point here, is that the story reminded me of the way in which a threat takes on a dominating role. I could have been reminded of global warming, but I happened to think of an old chess story attributed to a chess player by the name of Nimsowitsch. This is now leading me to look more actively for examples of threats to a leader, and for convenience I label the process the Nimsowitsch principle. Maybe the concept will help me act differently in the future, not just in a chess game, but faced with real-life crises. A second example is the map of management and organisational structures often known as Fordism (after Henry Ford’s production line innovation). A colleague suggested that Toyota’s lead production methods were moving manufacturing away from Fordism, and associated with a new leadership approach. I found refrences to Toyotism. What if, I wondered, we were seeing a shift in leadership approaches to include Eastern philosophic values. Perhaps inspired by a well-known book on the Tao of leadership, I added another concept to the map, and coined the term Toyotaoism. It’s a process of triangulation through which you combine your connect your received knowledge maps, with your personal experiences, and with the stories available every day of other leaders and their actions. Leadership as block busting was dealt with in an earlier blog. One new twist is worth mentioning, namely to link block busting to the leadership development ideas of Carl Rogers. In his writings, Rogers explained creativity as the output or manifestation of self-actualisation. Why is creativity so rare and prized? Because of those distortions of the (Rogerian) ‘true’ self through socially imposed bias, which produces denial or distortion of the creative journey of discovery. For a recent introduction to creativity in business see the (admittedly lengthy) monograph from The Innovation Research group at Brighton University Business School. The report goes far more deeply into the brief summary offered here. We have identified several Lateral Thinking techniques which help in the production of new ideas. The techniques (Reversals, Wouldn’t it be Wonderful If, and Jolts) are summarized in a power point presentation on using Lateral Thinking in project teams. The leader as bridge builder is implied in the leadership literature. The textbook Dilemmas of Leadership explores the concept as trust-building. Leaders who believe in a trust-based style accept that they have to grant followers permission to act without direct leadership control. This leads to a dilemma of granting power to others if the leader wishes to exercise more direct control over them. Trust-based leadership facilitates and invites change rather than directing it. In Celtic legend the story of the giant Bran tells of the way a great chief has to be a bridge. In the Romance of Branwen, there is a curious passage where Bran and his men come to an impassable river. Bran says, “he who will be a chief, let him be a bridge”, and lays himself down to form a bridge over a river, allowing his army to cross over. The narrator of the romance tells us that this was the first time the saying was uttered. In negotiations, the bridge building style is essential where it is vital to avoid win-lose outcomes (that’s back to the Nimzowitsch principle, by the way). It is necessary as peace process negotiations develop. It is often needed to resolve honesty held differences, by making a creative leap. The related concept of ‘join up’ was originally developed by Monty Roberts (The ‘so-called Horse Whisperer’ in the film starring Robert Redford). Join up involves collaborative working, even if one partner may have more power and responsibility that others. It has since been extended to provide insights for trust-based leadership methods applied in Primary and Secondary Schools, as well as in business and social care environments. (Note, these are unequal power partners, where there can still be respect, Rogerian unconditional positive regard of the other partner, be it a child, a horse, or a remedial prisoner). A simple to use concept is to look for Yes And rather than Either Or in your leadership efforts. 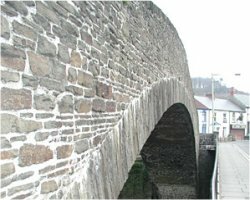 As a bridge building technique, Yes And has been documented as having been applied successfully in numerous trust-based projects to achieve better decisions, harmony, innovation, and other creative outcomes. It offers a way to work through the (Rogerian) blocks which would otherwise reduce individuals to feelings of powerlessness. Various approaches have been described to support the process of leadership development, that is to say the process of becoming the leader you are capable of becoming. Using a humanistic approach developed by Carl Rogers, three aspects of leadership development were studied: map making, block busting, and bridge building. In what ways do the suggestions support (or challenge) your beliefs about leadership, and suggest learning for future actions? You are currently browsing the archives for the Nimzowitch principle category.